“I’ll just pop over to the teashop and pick up your phone,” I said, “I’ll be back in a minute”. As it happens, I was back in less than a minute, because what welcomed me as I walked through the teashop kitchen door needed a swift team effort. You see Monday was a bit of a wet day, to say the least, and although I had paddocks that looked like lakes, I never imagined that we were going to get flooded again. 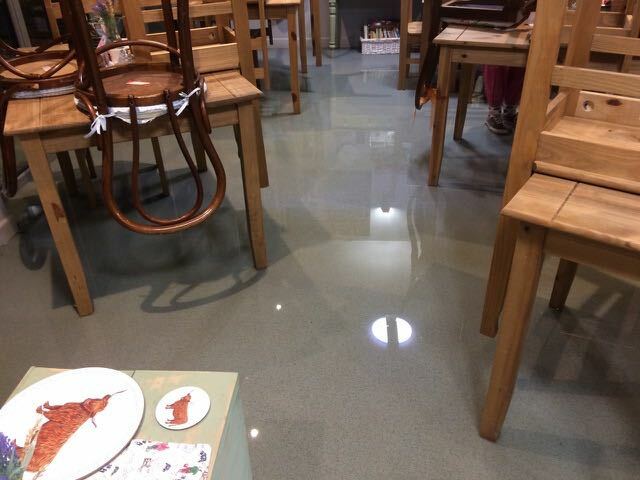 The teashop, kitchen and toilets were all under several inches of water, deeper than last Boxing Day and this time we were full of furniture, stock and everything else that a business like ours would have. So, armed with countless buckets, snow shovels and mops we cleared out the water, which had been lapping around our ankles, before drying the floors with rolls of blue hand drying paper and then giving them a proper mop to clean everything through thoroughly. The next morning you would never have a clue what drama had gone on the night before and maybe surprisingly, we were open as usual at 10am on the nose. The water levels had subsided, much of the surface water had disappeared and the inquest really kicked off with us working out how and why the water had got so far and inside the building too. The new drainage pipes were all working well, the ditches were all flowing, but the deluge that came down around tea time tipped the nearest ditch over the edge. The water, which the ditch couldn’t cope with was finding the lowest route it could to run away. It just so happened that its favoured route took it halfway across the car park and then turned right, straight down the new footpath to the front door of the teashop. As you would expect, additional measures are now underway and, by hook or by crook, we are going to crack this little problem. The day had started off so well and the potential calamities I always envisage happening when taking the pigs on their last journey once again never materialised. With my daughter Olivia’s help, I had backed the trailer up to the pig pen gate in less than five minutes, which is a new record by a long way. As I was only taking three of our five pigs with me, I expected much more of a challenge sorting them out, but of course I forgot that Piggy McDoodle and her friends were the greedy ones and were always going to make it to the treats in the trailer first. So, they were delivered safely and without any incidents and I subsequently returned home to the farm. Between taking the pigs and the evening’s shenanigans, there was just one other thing I was going to mention on that fateful day. The wind had started to get up and mid-afternoon I heard a rather unnerving crash behind the barn. I ran from the cow field and found that Frank and Betty’s rather comfortable house was in bits, in the ditch behind the barn. I did go seeking sympathy and a little assistance from the women folk in the kitchen, but was met with only stifled laughter and not much else. Frank and Betty are now residing, for now, with Queenie and Rita the hens, as their kids, George and Mildred, don’t appear to be in any mood for entertaining their parents any time soon.